Family Line: Latitude Screen Size: 14"
Ever Popular. Although it has practically died out in the consumer notebook sector, the compact 14" format is still one of the most popular styles of business notebooks. 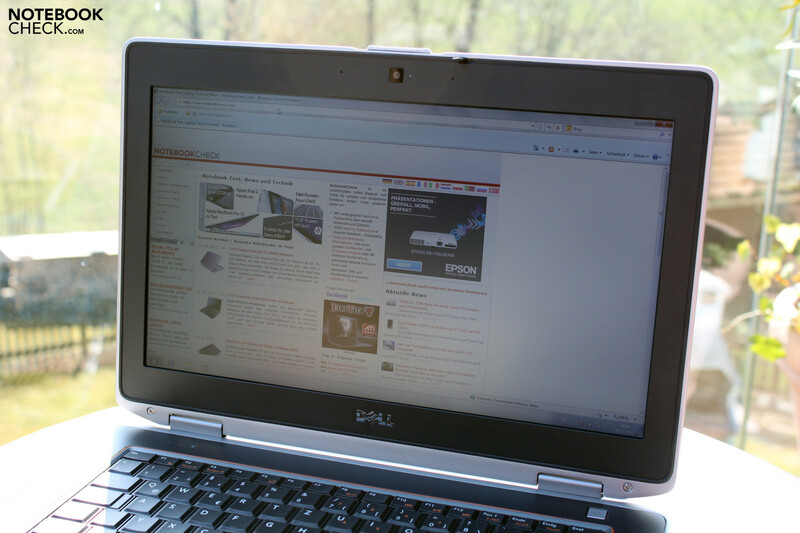 The Dell Latitude E6420 has some big shoes to fill in taking the reins from its successful predecessor, the E6410. Is it a credit to the Latitude series or does it bring shame to Dell? Our teaser article about Dell's new business line-up from a few weeks ago stirred up an unusually high level of controversy in our forums. Among the subjects of clashing opinions was the completely new case design. While some saw this as putting a friendlier face on the notebook, others argued the notebook design has lost all semblance of professionalism. But whatever your opinion may be, one thing's for sure: the sharp, rigid design of the previous generation is no more! Now, the E6420 rather resembles the new XPS models. Taking a look at the competition, Lenovo's new Thinkpad T420 remains loyal to its predecessor, the T410—the design shows only minor modifications. HP, meanwhile, presents us with the complete opposite of Dell's design in the form of their new Elitebooks. 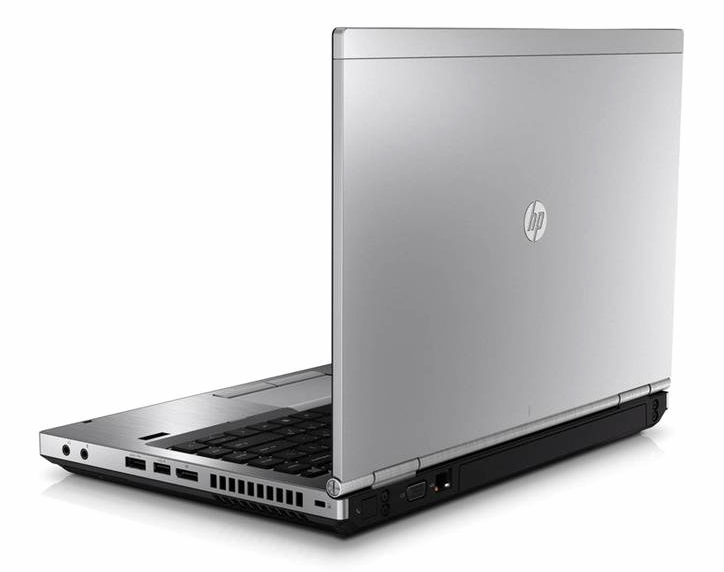 Its top-model, the HP Elitebook 8460p, brings back the retro, "boxy" style which is likewise sure to evoke some strong feelings one way or the other. Technically speaking, all notebooks are very similar. All try to impress with their sophisticated security mechanisms, a wide range of use and, of course, the combination of high performance and long battery life. These will be—among others—the main criteria for the following review since you can argue about which design is better until the cows come home. Like the design or not, this laptop is one of the sturdiest looking Latitudes of the series in recent years. The good choice of materials used in constructing the case of the Latitude E6420 are to thank for this. We scanned the surfaces, looking for plastic but found it only around the keyboard and the screen bezel. The other surfaces consist of an aluminum-magnesium alloy. Dell calls this composition Tri-Metal and refers multiple times to its adherence to various—albeit not very convincing—military standards. The base unit is unbelievably warp-resistant thanks to the sturdy magnesium frame that tightly cradles all the hardware inside. 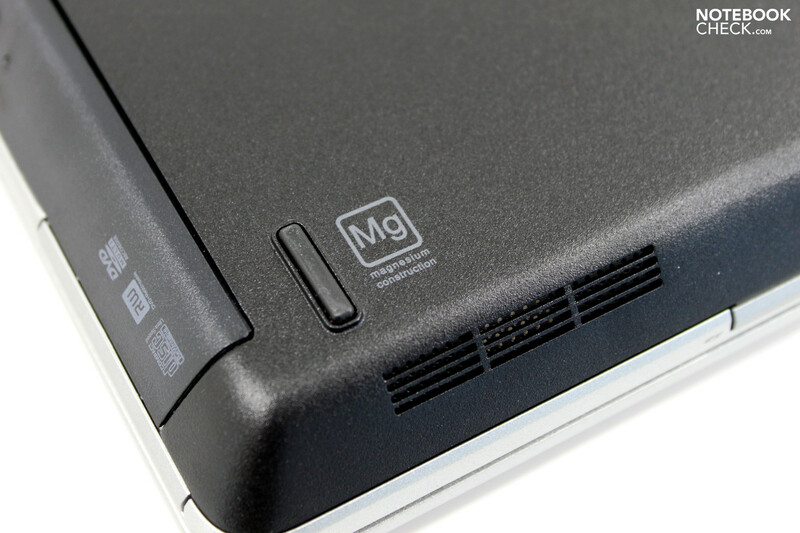 Unlike many of its competitors, Dell proudly displays a bit of this magnesium frame peeking out of the notebook along the side edges. The base plate and case surface around the keyboard are joined to this frame and fastened to it with screws: "Unibody Lite" if you will. Our attempts to dent the surface had no effect whatsoever. This includes the display lid that won't budge even a millimeter under pressure. 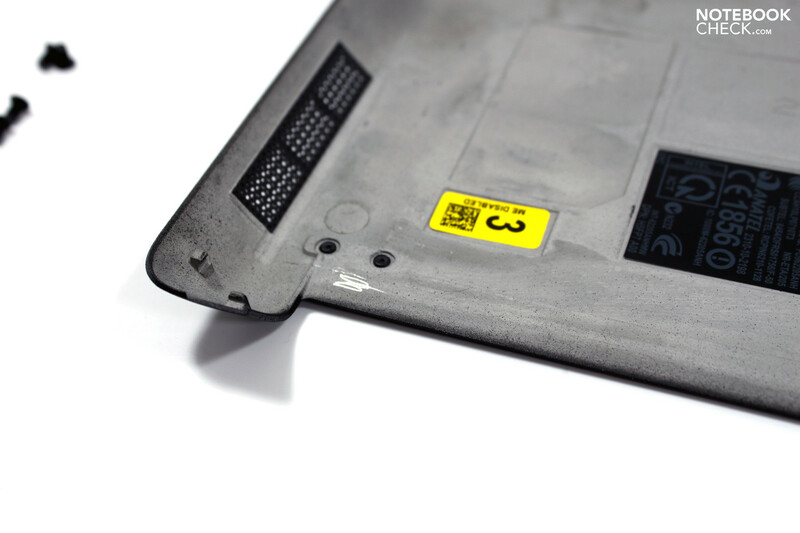 According to Dell, the display lid hinges are composed of tough steel, which is however not visible on the surface—as is the case with Lenovo Thinkpads—but is rather covered up a by a layer of magnesium. The display lid takes a bit of effort to tilt back but barely bobs back and forth after being adjusted. Like HP, Dell is stepping away from the approach of sticking individual rubber pads along the display to soften closing. Instead, they've gone with a long rubber strip encompassing the entire screen, which should serve to protect the screen and keyboard from dust particles getting in when the laptop's closed. A single hook clasps the display shut. Repairing or switching out hardware is quite easy. The hard drive is secured by four screws, after removing which it can slide out from the case sideways. The rest of the hardware can be accessed by removing a cover along the bottom of the base unit which is fastened with a few more screws. The fans and heat sinks, the processor, memory, PCI module and the CMOS battery are all ready to be tinkered with once the cover is off. Taking another look at the competition (Lenovo T420, HP 8460p), we see that the other contenders for your money also weigh a similar amount. The standard model of Lenovo's T420 weighs in at 2.24kg, that is, with a 6-cell battery included. HP's model with the smallest possible 3-cell battery comes to 2.07kg, the same as the Dell E6420 with a 4-cell battery. The particular configuration we reviewed included a 9-cell battery (97Wh), bringing the grand total up to 2.620 Kg. In terms of case dimensions, E6420 is the widest at 352 mm. The Lenovo T420 is 12 mm less wide and the HP 8640p 14 mm. The same is true for case depth: the front of the E6420 juts out about 10 mm when placed side-by-side with its rivals. The Lenovo T420 is the thinnest of the three at 30mm when closed (E6420 and 8460p both 32mm - all figures based on info from the manufacturers). Now we get to the selection and placement of ports on the E6420. Particularly the placement of the ports jumps out at you when you first look at the laptop, which are found around the back corners. On the left side toward the front, we find the Smartcard Slot followed by an exhaust vent, a combination headphone/microphone jack, a VGA port and a USB 2.0 Port. Around the corner at the back, we continue with an RJ45 Ethernet port and the power connector. At the right toward the front, we have a 45mm Expresscard slot and underneath it the DVD drive. After that come two USB 2.0 ports and a combined USB/eSATA port. At the back toward the right we find an HDMI port and a Kensington Lock slot. Along the front we also find an SD card reader. It's disappointing that no USB 3.0 port is on board. Of course, the eSATA port offers faster transfer rates than USB 2.0, useful for transferring large files like when backing up data onto an external hard drive. Still, the eSATA port isn't used for many devices and doesn't seem to have much of a future to it. Newer external hard drives are USB 3.0 compatible, with eSATA slowly disappearing from the market. The optional USB 3.0 offered in place of the DVD drive doesn't sound like a great trade-off because one: you'd miss out on the DVD drive and two: you still have to pay more for the USB 3.0 adapter (exact price not available). We see, however, that HP wisely chose to include two USB 3.0 Ports (+eSATA) in its 8460p, while Lenovo—like Dell—has gone down the eSATA route for the T420. Another important feature would be the choice of video output—HDMI 1.3(according to Dell). Hopes of using multi-monitor setups (+2x24“ FHD via DualHead2Go) or high-resolution 30-inch (2560x1600) screens go down the drain, the only option being 180 Euro more for the appropriate docking solution. HP and Lenovo, however have the right idea in this regard, both the 8460p and T420 have a Displayport. On the other hand, the placement of ports is excellent. Even without a docking station, the Latitude E6420 can be hooked up to numerous devices at once without cluttering up the surrounding workspace with cables. Speaking of docking stations: the E6420 can be hooked up to existing docking stations including: E-Legacy Extender, E-Port and E-Port Plus—if in doubt, speak with someone at Dell. 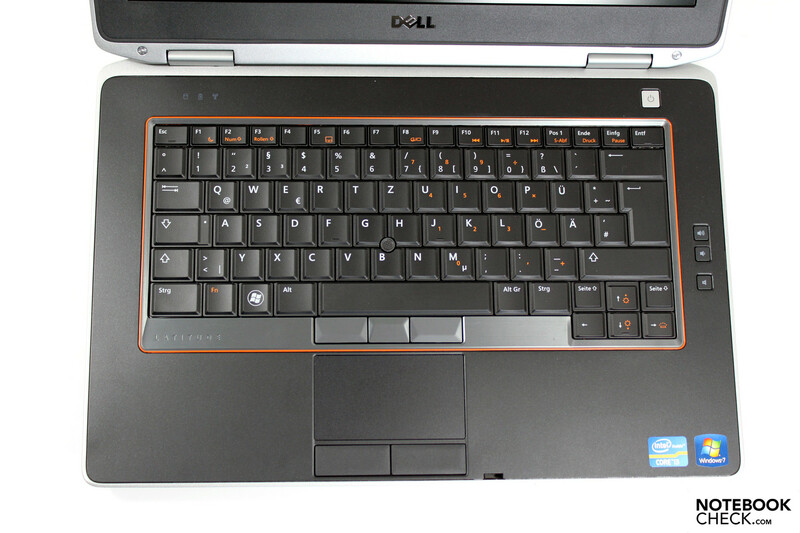 As is typical of Dell, the Latitude E6420 with a wide array of options for connecting to the internet. At the ground floor there's, of course, a gigabit Ethernet port (Intel 82578LM). You also have your choice of a Wifi card from Intel (b/g/n) or from Dell bzw. a/g/n). The Latitude E6420 can also be equipped with a UMTS/HSPA module on request. The spot for the SIM card is found in the same slot as the battery, the antenna line for which was already ready-to-use when we got our review model. With the appropriate module, this too can be upgraded later on down the line. Bluetooth 3.0 is optional, as is a built-in 56k-modem (V.92), which might come in handy if you're traveling through rural or otherwise remote areas on a business trip, for instance. Business professionals know that security cannot be overlooked when choosing a laptop. To limit access to the laptop, the Latitude E6420 comes with a smart card reader (contactless reader also available). You can even request a fingerprint scanner (FIPS standard available). It's also possible to install anti-theft software to track the laptop if stolen or remotely delete sensitive data. Note: you must opt into such service BEFORE the act of theft and there are usually regularly scheduled payments associated with such services. Since we're dealing with a premium business laptop here, Dell gives you your money's worth by throwing in a standard three-year on-site service warranty with next-business-day repair. This minimizes the amount of time the laptop has to be out of commission in case of a defect so that you won't be delayed much in your work. If this level of service doesn't cut it, you can always upgrade to Dell ProSupport (+145 Euro) which tacks on around-the-clock technical support over the phone including questions concerning software developed by third parties. For the aggressive or perpetually clumsy there's additional coverage for damage inflicted by fluids spilled onto the laptop, power surges, dropping the laptop down long flights of stairs, etc. This coverage will run you an additional 150 Euro without theft protection or 240 Euro with theft protection for 3 years (excluding VAT). With the change in case design comes a new keyboard layout to get used to. Among the changes is the box of special function buttons at the top right corner, including the buttons "insert", "delete", and so forth. These buttons are now arranged in a single row in which the individual buttons are bit more bunched together than before. Also, the "page up" and "page down" buttons have made their way down to just above the arrow keys. Although it might take some getting used to, the new layout doesn't bring many restrictions with it—although the keys are definitely bunched together more. Typing on this keyboard is quite comfortable. Keystrokes are firm, requiring a fair amount of pressure before they plop down, which gives them a very easy-to-feel pressure point. Even when jabbing away at the keys, the noise they make remains subtle and tolerable. A great feature is the keyboard backlight, which costs an additional 40 Euro but makes for easy-to-recognize keys no matter the lighting situation around you (convenient on the train, bus, plane, etc.). Naturally, this includes a water-resistant keyboard cover. For moving the cursor across the screen, Dell provides us with two options here: trackpoint (aka pointstick) and touchpad. A few things have changed here from the previous model. The color of the keys has changed as well as the fact that the rubber circle of the pointstick is no longer completely black. The trackpoint works incredibly well. The trackpoint on the Thinkpad T420 reacted very similarly in side-by-side testing. Only the shape of the trackpoint on the Thinkpad is (in our opinion) better. The multi-touch pad measures a conveniently large 8x4.5 cm and has a nice, smooth surface. The multi-touch functions can be configured to your personal preferences via pre-installed software. The touchpad buttons are just as comfortable to use, having just the right depression depth and clicking almost silently. Just by looking at it, you can tell that this display shines very bright. This is confirmed by our measurement of a maximum of 320 cd/m² at the center of the screen and is quite high for a laptop of its class. The average screen brightness is somewhat lower at 277 cd/m², the drop being attributable mostly to the dimmer corners of the screen. The brightness distribution comes to an okay 79.7%. 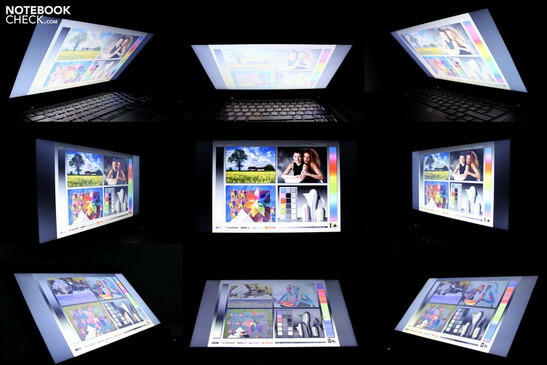 Nevertheless, because of the overall very bright screen, differences in illumination cannot be detected with the naked eye. The Lenovo Thinkpad T420 with an HD+ display shines a bit dimmer (max. 223 cd/m²) but has better picture contrast (162:1)—review coming soon. Soon we'll also have a review of the lower-resolution HD display version (1366x768) of the E6420. 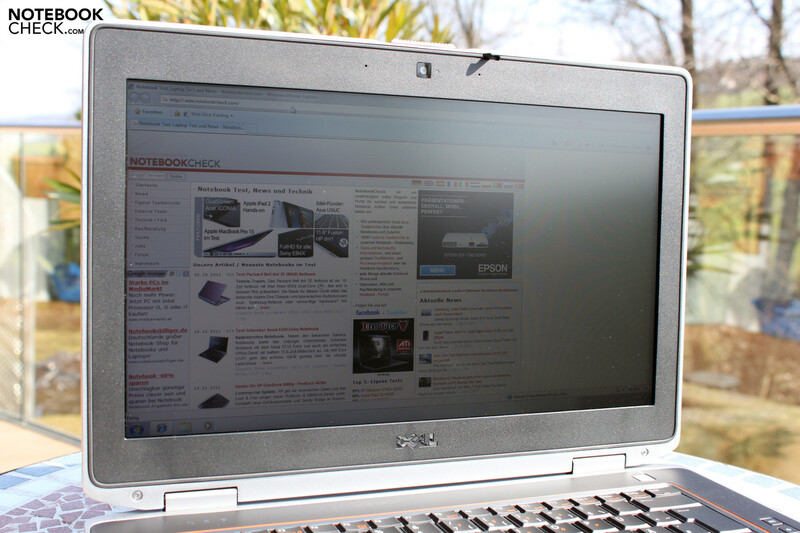 Also coming soon is a review of the less expensive Latitude E5420, also a 14" business notebook with an HD display. Most likely the same display is in place in the E5420 as comes standard for the E6420 series. So how good does the picture look on this screen? Blacks appear not very saturated and the picture has a sort of cold color tone, that is, more of a blue tone. Measuring the black level, we get an undesirably high 2.52 cd/m². Therefore, despite its high level of brightness, the screen only manages to reach a low contrast ratio of 127:1 (max. brightness, center screen). As far as the color space goes (spectrum of colors that can be displayed), Dell isn't serving up any delicacy, rather just the usual. neither Adobe RGB nor sRGB are covered. The WXGA+ display from the preceding model, the E6410, is just about on par with this. It's the same story with the HD+ screen in the Lenovo Thinkpad T420. 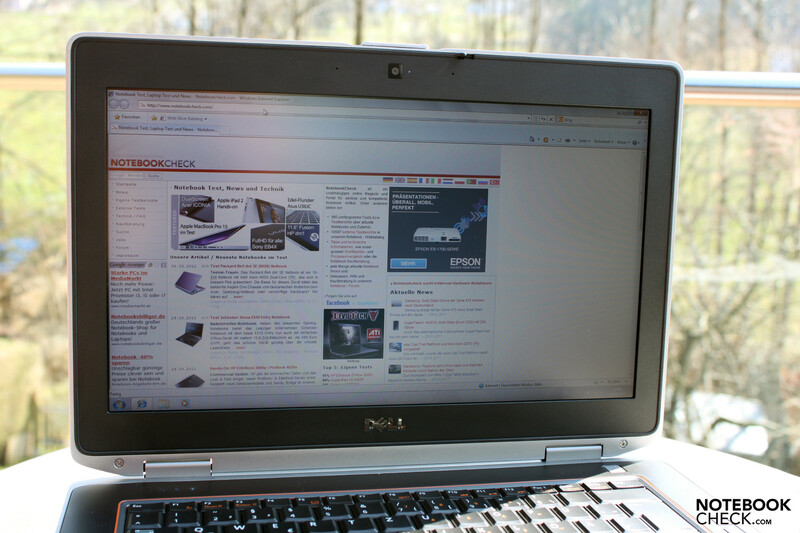 Compared to the Apple MacBook Pro 13 or the Dell XPS 15, the much narrower variety of colors that can be displayed on this screen is easy to see. As far as using the Latitude E6420 on the go, the display remains fairly readable regardless of your surroundings. The matte screen surface prevents reflections from overshadowing the picture and combined with the high brightness, it makes for always discernible screen contents, even in direct sunlight. The last thing we test for regarding the display was the range of viewing angles. The picture remains undistorted at fairly large angles looking from the left or right. There's much less wiggle room when it comes to tilting the screen back and forth, however. The screen contents remain easily readable for a while when tilting the screen down, but tilting it up past the ideal viewing angle quickly results in an overexposed-looking picture and later like a negative of the actual picture. During the review, we often had to adjust the tilt in order to be able to see the screen clearly. The reason 14" business notebooks are so popular is probably the balance between portability and performance. Whereas 12" and 13" laptops are normally restricted in their hardware, 14" laptops can usually be equipped with standard processors and even dedicated graphics cards. Which brings us to the configurations available for this notebook: ranging from the weakest and least expensive Intel Core i3-2310M CPU all the way up to the i7-2720QM quad-core CPU, Dell makes the entire Sandy Bridge line of processors available for the Latitude E6420. The case has two RAM chip slots that can address a maximum of 8GB. Price: having the best hardware in place can run you an extra 194 Euro depending on the basic configuration you get regarding other features (e.g. display). Dell Online Shop: "35W and 45W" NVS 4200M? There's also a lot of selection when it comes to the graphics card. With the basic configuration, the CPU comes with an integrated Intel HD Graphics 3000graphics card. This configuration should suffice for typical office work. With higher demands regarding 3D graphics or special software, you can definitely benefit from the power of a dedicated graphics card like the optional Nvidia NVS 4200M graphics card (Optimus). Dell's online shop makes things a bit confusing here: the NVS 4200M supposedly comes in two version, one listed as "35W" and another at the same price listed as "512MB (45W)". Speaking over the phone with a Dell representative, we were told this was a mistake and that only the "35W" NVS is available for the E6420. 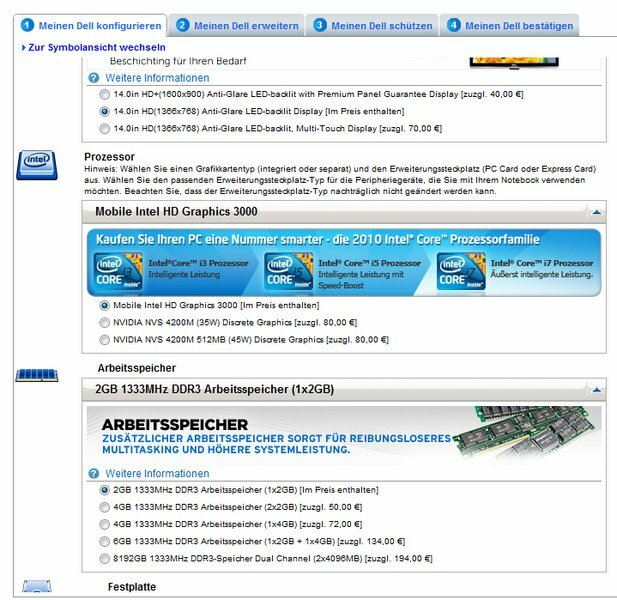 This was the version of graphics card in the laptop we reviewed, but the Nvidia settings identified it nevertheless as having 512MB DDR3 video memory, which according to Dell's website is only available in the "45W" version. According to official Nvidia specifications, the NVS 4200M runs at a clock rate (speed) of up to 810 MHz, while the processor can supposedly reach as high as 1620 MHz. In the system properties menu of the model we reviewed, the clock rates were displayed as 740/1480 MHz. This seems to indicate that a watered-down version of the NVS 4200M was in place in the particular Dell Latitude E6420M model we reviewed. During our hardware stress test, we measured a GPU temperature of up to 99°C, which seems to high for the 45W version of the NVS 4200M running at its maximum clock rate (and this seems to go along with what the Dell representative told us over the phone about there not being a 45W version available for the E6420). You can find more details about the Nvidia NVS 4200M in our Comparison of Mobile Graphics Cards. Our in-review configuration consists of the Intel Core i3-2310M, the smallest of the available Sandy Bridge CPUs, paired with the Nvidia NVS 4200M ("35W"). The CPU performance really could have been better. According to measurements in previous reviews, switching from a i3-2310M CPU to a 2630QM CPU—all other hardware remaining the same—results in a jump of about 45% in the overall score in the PCMark Vantage (64 bit) benchmark. In terms of price-to-performance ratio, the i5-2410M und i5-2520M give you the most bang for your buck. 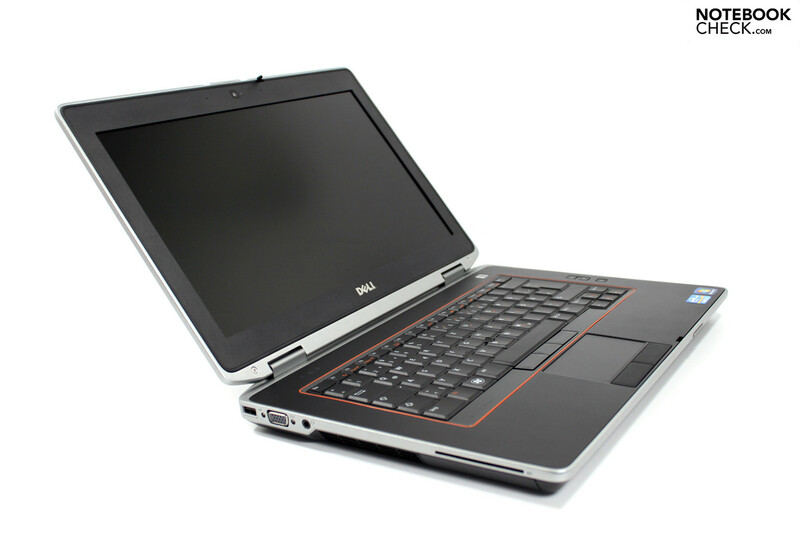 Our Dell Latitude E6420 managed an overall score of 5534 points, tested in the "high performance" profile. This lands the notebook an average spot in our database, placing it on par with the Lenovo T410 (620M/NVS 3100M) and the Acer Travelmate 8472TG (350M/GT330M). When equipped with an i7-CPU, the Latitude E6420's score shoots up to 8000 points in PCMark Vantage. For a huge boost in application performance, choosing a Solid State Drives (SSD) could be a great decision, which should easily break the 10,000 point barrier in PCMark Vantage. The best example of this is the Thinkpad T410s (580M/NVS 3100M), which boasted an impressive 10926 points when equipped with a solid state drive. Speaking of performance, we were curious to try out a certain new option in Dell's Control Point software called "Ultra Performance", which claims to "reduce CPU throttling" while raising the fan speed. We weren't really able to measure the effect very well, however, considering test results were not significantly different under the "Ultra Performance" profile and since the Intel Core i3-2310M CPU does not have the Turbo Boost function. It's already well known what the Intel Core i3-2310M is capable of. At a base clock rate of 2100 MHz, the chip lacks the appealing Turbo Boos feature of its i5 and i7 cousins, but thanks to Hyper-Threading can still simulate two virtual cores in addition to its two real cores, thereby making multicore-optimized applications run a good deal faster. The CPU's performance is akin to older top-of-the-line Penryn processors (P9600) and in some ways can even outdo some of AMD's currently most powerful processors (N640, N660). The results of the Cinebench Rendering benchmarks are as to be expected for the CPU. If the software you're using requires better CPU performance, it's best to consider an i5 or i7 CPU instead: CPU-intensive software (complex calculations, virtual machines, etc.). We'll stick with the Cinebench benchmarks, which in addition to the CPU Rendering test also has an OpenGL performance test for checking the performance of the graphics card in place here. In the Cinebench R10 64bit Shading test, our laptop managed 4471 points. Scores in this range are quite popular in our database, comparable GPUs being the ATI Mobility Radeon HD 5650 and the Nvidia NVS 3100M (Thinkpad T510 – 4563 points and T410s with 4445 points). The Nvidia NVS 4200M doesn't quite represent a miracle on the CAD front, which is confirmed by the SPEC Viewperf 11 benchmark. Nearly every resulting value placed the GPU below average, just ahead of the NVS 3100M. Quadro FX or FirePro graphics can run laps around the NVS 4200M. The performance check wouldn't be complete without the 3DMark score. At 4601 points in the 3DM 2006 Test (1280x1024), the GPU here is on par with the Geforce 320M and the GT 130M. Interestingly enough, our database shows that even Intel's on-board HD Graphics 3000 sometimes approaches the 4000 point mark, depending on the hardware configuration at hand.